**The following instructions will allow PMDG users the ability to "load" the following special approach procedure into their FMC for selecting via the approaches menu. Non-PMDG users can still fly this approach by manually entering the fixes/restrictions. ****NOTE: Updating AIRAC data will override these inputs requiring you to make the previous edits again. Many airlines utilize a company procedure called the FMS BRIDGE VISUAL 28R APPROACH. It is very similar (same lateral path) as the QUIET BRIDGE approach but adds RNAV and VNAV capability. This procedure is not available via Airnav or NAVIGRAPH updates, but can be flown by either manually loading the fixes/restrictions into the legs page; or via pre-programmed setup shown below (PMDG aircraft only). Under Microsoft Flight Simulator X/PMDG/SIDSTARS/KSFO.txt, find FIXES and input to following information at the end above ENDFIXES (don't leave spaces). then find APPROACHES and input the following information at the end above ENDAPPROACHES (don't leave spaces). Expect (but do not proceed until instructed) "Depart CEDES direct ARCHI, join the FMS Bridge final approach course." Then if you have the bridges in sight, expect "Cross ARCHI at or above 8000, cleared FMS Bridge Visual Runway 28R approach." If you do not have the bridges, or for traffic, expect "Descend via the FMS Bridge." Then you should descend on the approach just like an RNAV STAR and expect a clearance closer in. Approach is authorized to participating aircraft (preset or manual entry) whenever ATC is online at this airport. Aircraft capable of flying this special approach should advertise |FMS28R capable| in the additional comments section of your flight plan. Many airlines utilize a company procedure called the RNAV VISUAL RUNWAY 19L/R APPROACH. Aircraft landing on Runway 19L/R from the east need to parallel the 25's until about a 2mile base to final turn abeam the Stratosphere Tower (due to the proximity of Nellis AFB to the north. There are also many helicopters operating over the city. The RNAV VISUAL approach gives LNAV/VNAV guidance to the intended track. This procedure is not available via Airnav or NAVIGRAPH updates, but can be flown by either manually loading the fixes/restrictions into the legs page; or via pre-programmed setup shown below (PMDG aircraft only). Under Microsoft Flight Simulator X/PMDG/SIDSTARS/KLAS.txt, find FIXES and input to following information at the end above ENDFIXES (don't leave spaces). The result is selectable RNAV Visual Approaches to both Runway 19L and Runway 19R (top of next page). Expect (but do not proceed until instructed) "proceed direct TRROP expect RNAV VISUAL RUNWAY 19R APPROACH. You most likely will be given a descent to 6000 before being asked to report the field in sight. Then you will be given "Cleared RNAV Visual Runway 19R approach". The chart is not humorous, the descent is indeed steep. Approach is authorized to participating aircraft (preset or manual entry) whenever ATC is online at this airport. Aircraft capable of flying this special approach should advertise |RVIS19L/R capable| in the additional comments section of your flight plan. I've just installed and did the FMS Bridge Visual 28R approach. From my friend's arrival at LAS today... apparently the A319 didn't like being hand flown. JetBlue is currently testing RNAV Visual Approaches at KBOS (to Runway 4L and 33L). Both overlay existing procedures: for 33L, the RNAV approach being tested overlays the Light Visual. 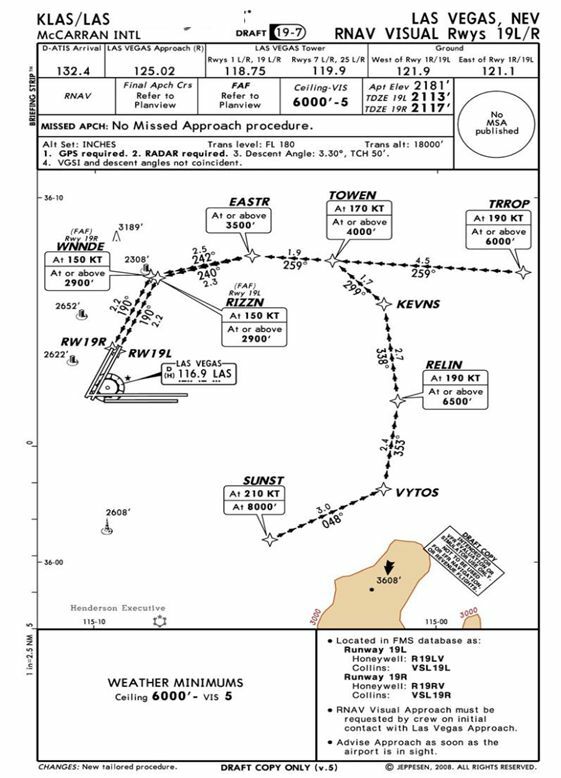 The Runway 4L RNAV Visual is pretty much the same line most aircraft given visual approaches to Runway 4L would follow. More information: http://bostonoverflight.com/phase3_documents.aspx (see the links at the bottom under "Operational Tests at Boston Logan International Airport". This approach is in use (weather permitting) after midnight local time for noise abatement. The following is for VNAV/LNAV/DIRECT TO FIX navagation, otherwise the approach is flown using VOR / ILS. Under Microsoft Flight Simulator X/PMDG/SIDSTARS/KBOS.txt, find FIXES and input to following information at the end above ENDFIXES (don't leave spaces). UPDATE: Added KBOS LIGHT VISUAL 33L APPROACH and edited title. For users of the PMDG NGX, an AVSIM user has created similar files for four small airports in Southeast Alaska that all have ASA service. The attached file includes the procedures for PAKT, PAPG, PASI, and PAWG. The procedures are generally not publicly charted, and offer spectacular visuals that bring you much closer to the terrain and runway than you might get using one of the traditional approaches. I've had a lot of fun flying these approaches in previous Alaska Getaways and thought it would be appropriate to share with the community. The PMDG NGX is a requirement. The file is a freeware download from AVSIM that I'm re-posting here (and is obviously not a product of BVA). All of the installation instructions can be found in the attachment, along with the credit for the original author, Mariano Bonaccorso. **The following instructions will allow PMDG users the ability to "load" the following special approach procedure(s) into their FMC for selecting via the approaches menu. Non-PMDG users can still fly this approach by manually entering the fixes/restrictions. **Consider this a BETA version. The arc's on the SID are untested and this is the first time I've attempted to program arcs in this manner. No arcs were programmed into the approach due to lack of data on the plate. Under Microsoft Flight Simulator X/PMDG/SIDSTARS/CYXX.txt, find FIXES and input to following information at the end above ENDFIXES (don't leave spaces). The way I understand it, the SID and APPROACH avoid training areas / terrain around the airport. Perhaps our local pilot/controller/resident Evan could provide further info. NOTE: Starting with this post, I will no longer provide screenshots. Look above for tips. The above referenced chart is obviously outdated. Nowadays, many companies use this approach when landing 13L. I've heard it so often, it seems to be the preferred approach when 13L is in use. Included is the DVETO transition which can be heard on the infamous "HOW COME NO ONE LIKES THE FIRST FIX? IT'S NOT ON THE PLATE!" video. Under Microsoft Flight Simulator X/PMDG/SIDSTARS/KJFK.txt, find FIXES and input to following information at the end above ENDFIXES (don't leave spaces).